The Government will today face one of its sternest challenges with teachers starting their series of rolling strikes – with the latest pay offer worth nearly $700 million over three years. The strikes start at 7.30 am in Auckland and are set to spread down the country later this week. The South Island will face strikes on Thursday and Friday. Mass meeting will be held to discuss the latest offer but things do not look hopeful as the New Zealand Educational Institute (NZEI) – the primary teachers’ union – said the offer did not address union claims for lower class sizes and more professional time. A 3% per year over a three-year term. A new top pay step for teachers with degrees, plus professional teaching qualifications from 2020. A $500 lump sum for union members only. Education Minister Chris Hipkins is expressing his frustration about the rejection of what he obviously regards as a generous offer. The new offer is worth $698 million, an increase of $129 M from the previous offer. The new offer will mean significant pay increases for union members and offer to provide for paid meetings to discuss the offer, the Minister said. Hipkins says the NZEI has let its members down by not allowing them to consider the new offer before going on strike. He wants them to stop the strike and allow a vote. The difficulty for the Labour Party, the majority partner in the Coalition Government, is the amount of support it receives financially and through volunteer help from the unions. Before the election, the Council of Trade Unions was firm in what it expected from Labour if it got into power. It wanted a change to employment laws introduced by National, particularly in allowing more freedom for union officials to visit worksites without notice. Also, the proposed change in bargaining arrangements will mean employers almost forced to come to a settlement through multi-employer contract agreements (MECAS). Labour certainly indicated it was prepared to walk the talk as far as rolling back National’s employment laws. And after nine years of criticising National for running down public services, such as health, education and the police, the expectation of higher wages in the first term was front and centre of the major state unions. Parents will be fine with a day of strike action here and there. But once parents have to find themselves taking a day off work to look after their school-age children, the novelty will wear thin. Plenty of workers in New Zealand would be happy to receive a $10,000 wage increase over the next three years through a 3%, 3%, 3% pay rise. Some workers have had no increase for nine years, or more. Education Secretary Iona Holsted said it was expected the NZEI executive would have waited for the recommendations of the facilitator and given its members an opportunity to property consider the new pay offer before deciding to go ahead with the strikes. If the Government and the Education Ministry loses this wage round with teachers, other state unions will be lining up with their hands out. In general, Kiwis hate prolonged strike action with memories of past disruptive action by watersiders, meat workers and workers on the Cook Strait ferries still in the minds of people of a certain age. Based on returns received by the Ministry of Business, Innovation and Employment last year, union membership as at March 1 last year was 355,511. This represents 17.2% of employees in the labour force. Total union membership fell by 0.45% compared to the previous corresponding period. The Government needs to find a compromise which does elevate the cost of the settlement. Hipkins says there is no more money available. The unions, fresh in the knowledge the Treasury recently reported a surplus of $5.5 billion, believe there is more cash to splash on wages and conditions. 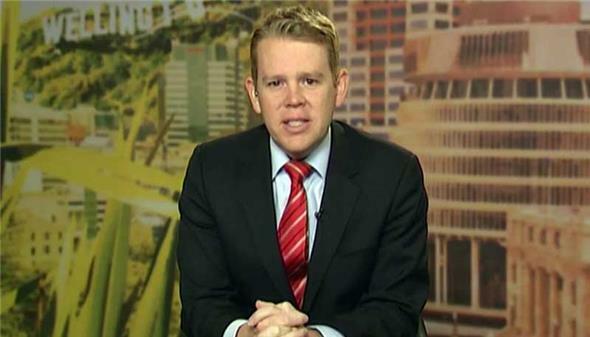 Education Minister Chris Hipkins. Photo: Newshub.